The RFPulse2000A is a wireless data logger that records pulse output signals from various sensors such as flow meters and anemometers. When started, the data logger samples at 100Hz and at the user specified reading rate, recording the total number of pulses from the sample to memory. The RFPulse2000A features an LCD screen which provides instant access to the current reading, minimum, maximum and average statistics. Through the software the device can be programmed to convert the pulse output into a different unit of measure such as gallons per minute or miles per hour. This information can be viewed on the LCD screen of the data logger as well as in the software. The RFPulse2000A is unique in that it not only calculates pulse count, but it also calculates pulse rate. Engineering units can be programmed into the device as a rate, which allows the device to calculate the measurement unit in rates per second, minute, hour or per day. This provides more useful statistics to the user when data logging over long periods of time. The RFPulse2000A can be used as a standalone data logger, or used with the RFC1000 wireless transceiver, to wirelessly transmit data back to a central PC. The RFPulse2000A transmits up to 500’ line of sight to the RFC1000 transceiver. Multiple RFC1000’s can be used as repeaters and transmit up to 1000’ line of sight to other RFC1000’s. This allows the data to be sent back over a greater distance. The RFPulse2000A can be used as a single, wireless data logging system, or can be expanded to a large scale system, which can include hundreds of data loggers measuring a number of areas (additional MadgeTech wireless loggers and transceivers may be required). 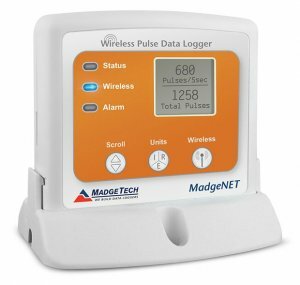 The RFPulse2000A utilizes the new MadgeTech 4 Software. Data can be viewed in graphical or tabular formats and summary and statistics views are available for further analysis. The software features export to Excel®, data annotation, digital calibration and more.